Hey hi! 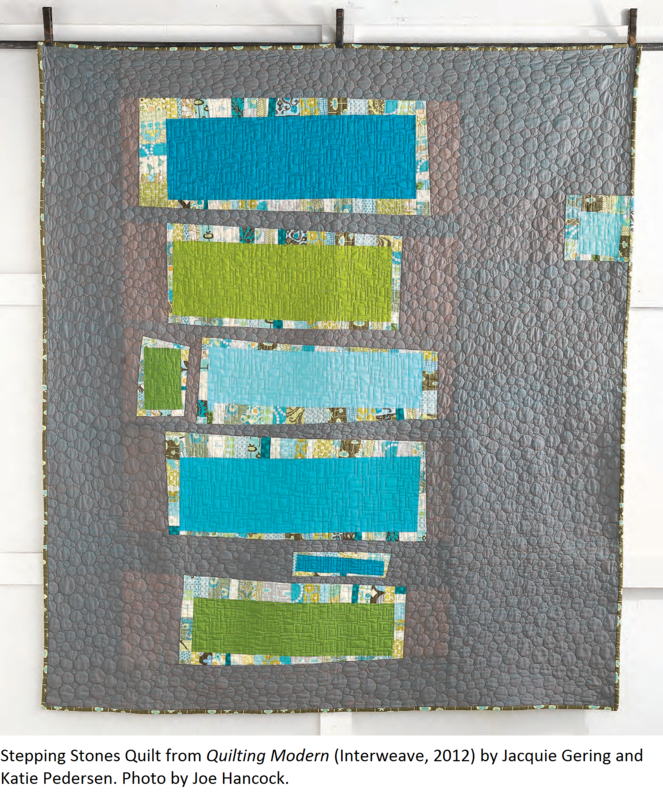 I’m so thrilled to be part of Jacquie and Katie‘s Quilting Modern celebration! Jacquie and Katie are right up there as two of my favorite quilters and bloggers, and in fact I’ve been reading both their blogs since I started quilting. So of course it’s no surprise that I was very excited at the prospect of their book, Quilting Modern . And indeed, I had reason to be excited – this book is absolutely gorgeous, right down to how it feels in your hand (something I find weirdly important!). I was inspired even after just a first quick peek through the book, and I wasted no time in starting a little something inspired by one of their quilts, the Swirling Medallion quilt. This one hit me with a “why didn’t I think of that!” – I absolutely love the combination of the half square triangles with their improvy flip and stitch triangle technique. It’s quirky and fun and I love how it updates the look of a half square triangle design. I had a whole bunch of teeny tiny half square triangle units left over from my Swoon quilt which I was desperate to sew up into a fun wall hanging. I hadn’t been inspired up until now, but as soon as I saw their Swirling Medallion quilt I knew I had found my answer. Then, because I hadn’t really gotten my fill of this design, I pulled out a favorite Lizzy House Red Letter Day print that I had been saving. 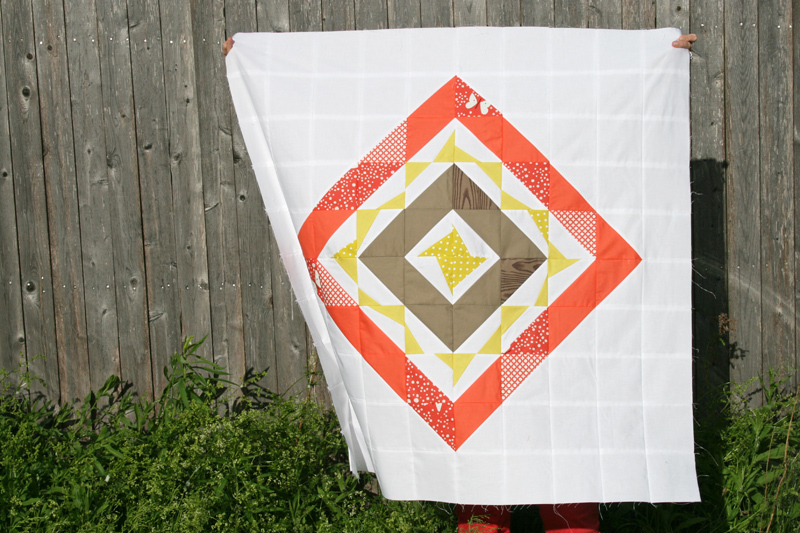 I love how Jacquie and Katie used a fun print for the backing of their quilt and used the colors from that print for the front, so I pulled some similar colored prints and solids from my stash and made up this baby quilt top. I can’t wait to get that Red Letter Day print on the back so I can see the whole thing together! Is it overboard to show you one last project inspired from the book? Perhaps, but I love this book so much that I just can’t stop! This last little project is based on their Stepping Stones quilt, which I shrunk way down to turn into a quilt block as my addition to Penny’s Traveling Quilt. As someone who typically shies away from patterns, what I most love about this book is that even though directions are provided to recreate their quilts, somehow they’ve also managed to create a book, and a series of quilts, that inspire you to put your own spin on their ideas. That truly is my favorite kind of book. Congrats Jacquie and Katie – I can’t wait to start on another quilt! 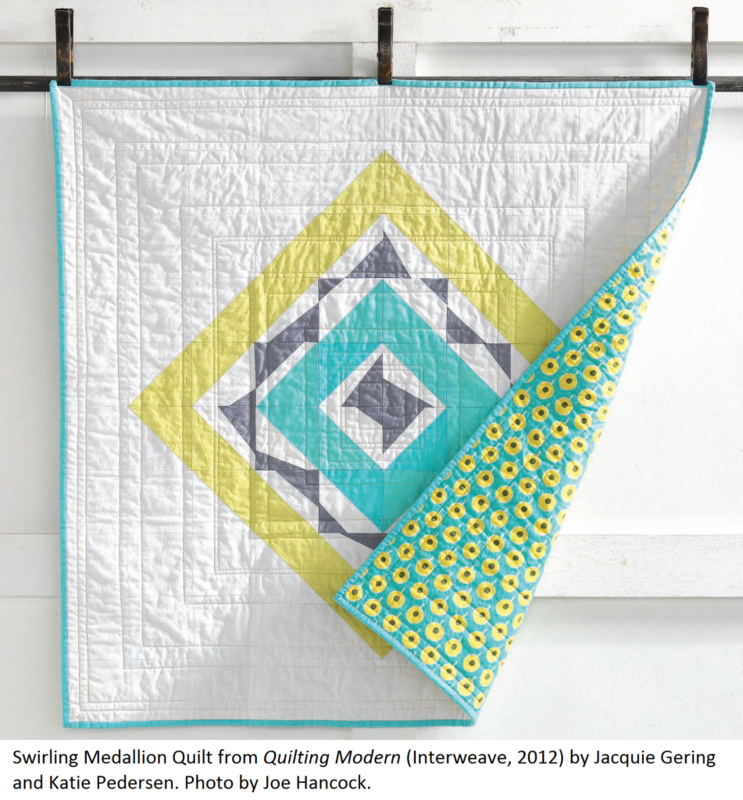 Stop over to say hi and congrats to Jacquie and Katie, and then be sure to spend some time this weekend checking out these other blogs for more information, projects, and giveaways during the Quilting Modern blog celebration weekend! This entry was posted in General and tagged book review, Posts about Quilts, quilting, quilting modern. Bookmark the permalink. 51 Responses to Quilting Modern weekend celebration! Wow – I hadn’t seen that much of the book yet and those are fabulous! Thanks for your review! This book looks amazing. And your projects inspired from it are just wonderful. Those flippy triangles look like fun to try. They definitely add something to the design. Love them. I love the way you used your fave pieces to make really striking work. My favorite of all was the stepping stones. It just felt like the motion of walking with the way they are placed. Thanks for sharing, have a good one. wow! talk about a great post! you make me want to run out and grab this now! Amazing! I love your interpretations of the quilts! Thanks for the peeks! And I love what you are doing with the ideas… Wow! I agree-the book teaches concepts, not just patterns. I love the baby quilt here-you’re fabric selection is spot on! 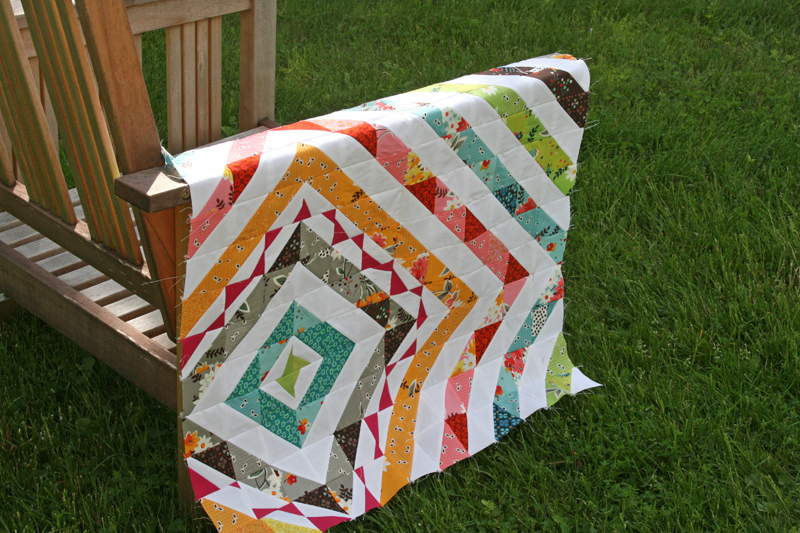 love your quilt with your swoon block highlights. I would love to get myself ‘out of the box’ with confidence! Thanks for the opportunity! I have been following Jacquie since I started quilting a few years ago and am always so impressed with what she does. Seemingly with ease. So cool. I love this book. It’s a fact. The book is inspirational! Look was it’s done to you. Thanks for the review. It’s fun to see what you’ve been inspired to create already. Love the Red Letter Day for the backing – I really like that idea too of using the colors from the cool backing in the front. Can’t wait to see it finished. oooh! i love the swirling medallion quilt! so pretty! That’s beautiful! You have inspired me this morning! Love how you used your favorite fabrics once you found just the right pattern/inspiration! It looks like you are having lots and lots of fun with this one already – love your Stepping Stones. Actually, what am I saying? Love them all! Thanks for some great eye candy this morning! I love these. I so want this book – maybe someone will pick up the hint for my B-day next week. Thanks for sharing pics from the book. WOW – you did a wonderful job – I love the book too! My head is spinning with lots of inspiration – now I just have to get to my machine….Thanks for sharing and for your inspiration too! 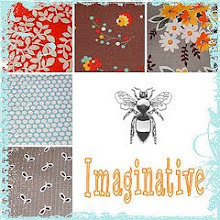 I love the ways you have incorporated their ideas in your quilts, I have the top one on my list to make too! what can i say except you inspire me right back. i adore what you’ve done and so appreciate that you continue to inspire the whole community. thanks for participating and “getting” the book. These are the first photos I’ve seen from the book. Wonderful designs! Oh, I love your versions! It has been fun seeing everybody’s quilts from the book. 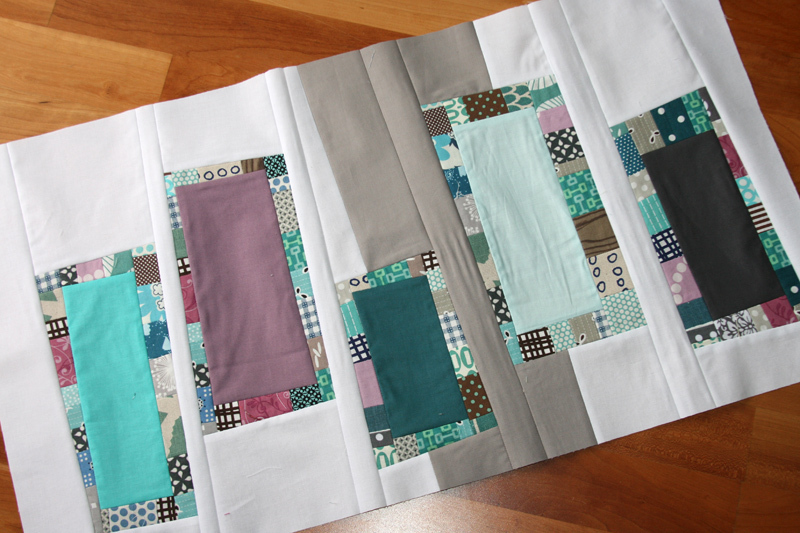 I just received some scraps that would be perfect in the Stepping Stone quilt. I’ll be adding that to my to-do list. i love the red letter day version! Thanks for a peek insode the book – it looks fabulous!! Thanks for sharing; enjoyed the post! Great review of the book! Thanks for sharing! 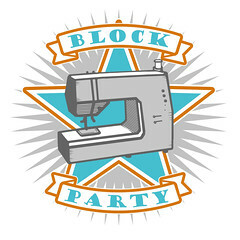 I love the block inspired by the stepping stones quilt. And I can’t wait to see the baby quilt finished (I love this Red Letter Day print, too). I am loving these quilts – I can feel a little on line book buying coming on…. Wonderful to see your interpretations of ideas from this book. I definitely look forward to seeing more – your work, together with this book, is a *lot* of inspiration for a quilter to ponder! Wow. Talk about inspiring! I love your two newest projects which were inspired by Jacquie and Katie’s book, Ashley. Your blocks are gorgeous! Fascinating! I love you got so excited about these techniques and colors! I love your takes on the swirling medallion quilts you did!! And the stepping stones you made for my traveling quilt are just magnificent. I love that Jacquie and Katie’s book is just so inspiring on so many levels! Thanks for sharing these…great looking projects!! I love the adaptations you did on their quilts! The improv look is drawing me in! Great book review. I love these new designs. It sets my head spinning. You have such a great sense of color! Love your inspired designs, Ashley! Thanks for participating in our celebration weekend. I like your shrunken down version of Stepping Stones – very inspiring.